Many people living in Georgia use their garage door more than they use their front door. For many with an automatic system, this daily interaction simply requires the pressing of a few buttons to trigger the opening and closing of the door. There's no doubt that the invention of the automatic overhead door has contributed to a more convenient daily routine. But what are the other benefits of joining the club of automatic garage door owners if you haven't already? We list some of the advantages below! 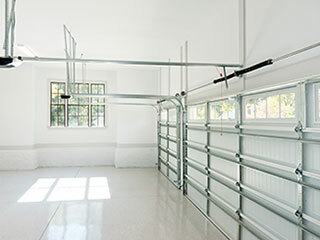 When an automatic garage door is installed and maintained properly, they can help to raise curb appeal and make it easier to sell or rent a house. Most of the time, the investment is truly worth it when it comes to long-term gain. A modern automatic garage door that is insulated properly can help reduce the amount of air escape from your house, potentially contributing to lower energy bills. If you're living in an area prone to fairly extreme weather, you can opt today for hurricane-proof doors as well as particular materials designed to be more resistant to high humidity, extreme winters or hot summers. Your automatic garage door will function as your 24/7 loyal servant, it'll work for you as well at three in the morning than in the middle of the day. If it's pouring with rain, there'll be no need to leave your car to manually open and close the entrance to your garage. The great thing is that backup systems are widely available today, so you'll still be able to operate the door when the power cuts out. Once you join the automated, technological age, your range of options when it comes to security rapidly increase. Modern openers come complete with safety reversal mechanisms to lessen the risk of damage or injury in the event something is in the path of the door while it's closing. Connected technology options today also mean that you can operate your door remotely from afar using your smartphone - need to give someone access from abroad? No problem! If you're interested in updating your current garage door, just give our repair team a call in Cartersville, Georgia - we'll be happy to talk to you and our professionals will be happy to help you find the right door for you.